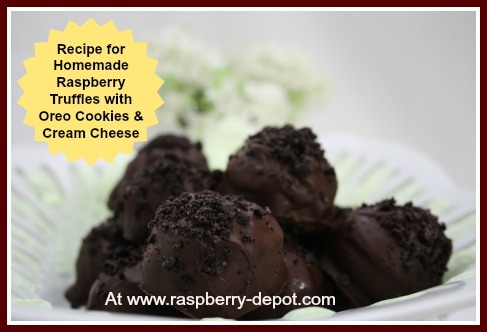 This easy-to-make Raspberry Truffles Recipe makes AMAZING truffles with cream cheese and Oreo cookies and dried raspberries! If you have other dried berries on hand, you can easily substitute those berries in place of the dried raspberries. 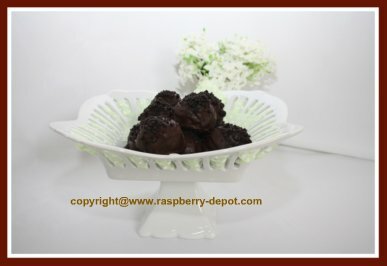 While my husband and I went to a Wedding this past Saturday, my daughter, Karissa, made these Raspberry Truffles ... they were absolutely scrumptious! We boxed a few for my other daughter, Lynnette, who was coming over in a couple days, but ... well, let's just say: "They kept staring at us ... so we ate them!"... don't worry though, we did keep a couple for her to enjoy! In a bowl, finely crush the oreo cookies with a potato masher or use a blender, until cookies resemble coarse crumbs. Set aside 1/4 cup of the crumbs in a cup. Using a whisk or a fork, mix in the dried raspberries to the bowl of crushed cookies. Using your fingers, mix in the cream cheese until well blended. Roll the mixture into about 1 1/2" spheres (balls). Place the balls on a cookie baking sheet lined with parchment paper or wax paper. Chill the balls in the refrigerator. Heat the one half of the chocolate chips and one half of the vegetable oil in the microwave for 40 second intervals on medium high power until melted. Stir often. Repeat with the second one half of the chocolate chips and the second one half of the oil. 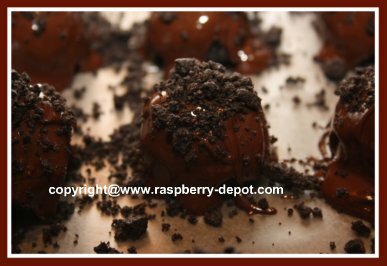 Drizzle the chocolate over the chilled truffle balls, or dip the balls into the chocolate. 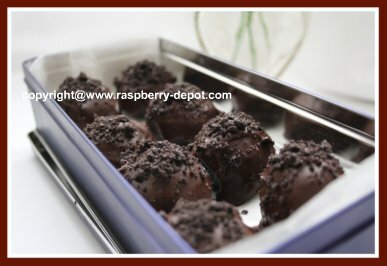 My daughter made the raspberry truffles in the photos by drizzling the chocolate over the top of the truffles. Sprinkle the reserved cookie crumbs over top of the truffles. Store the truffles in the refrigerator. Freeze them if you are planning to keep them more than a few days in the fridge. From time to time I cannot find dried raspberries for sale in local grocery stores. If you cannot find them in your local stores, you can, if desired, purchase them online at *Amazon.com. 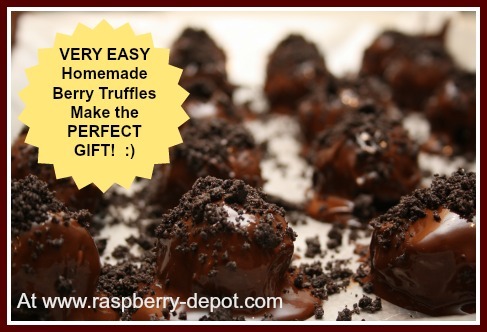 Homemade Truffles Make the Perfect Gift!